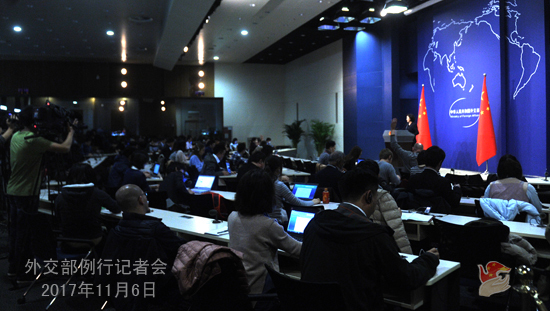 Q: We noted that yesterday the Chinese side released the information that Premier Li Keqiang will attend the series of Leaders' Meetings on East Asia Cooperation and visit the Philippines. How does China view the current East Asia cooperation and China-Philippines relations? What are China's expectations for this visit? A: Premier Li Keqiang will travel to Manila, the Philippines to attend the 20th China-ASEAN (10+1) Leaders' Meeting, the 20th ASEAN-China, Japan and ROK (10+3) Leaders' Meeting and the 12th East Asia Summit and pay an official visit to the Philippines from November 12 to 16. This year marks the 50th anniversary of the establishment of ASEAN and the 20th anniversary of the launching of the cooperation between ASEAN and China, Japan and the ROK. Next year we will celebrate the 15th anniversary of the establishment of China-ASEAN strategic partnership. Both the China-ASEAN relations and the East Asia cooperation are at an important stage of building on the past achievements and ushering in the new future. 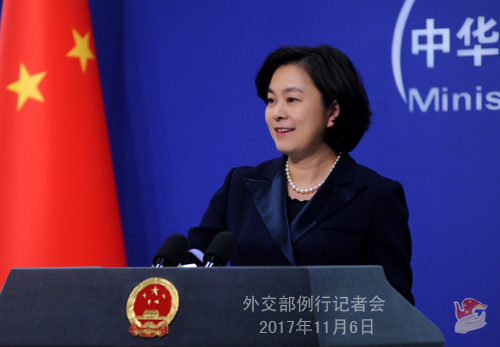 This year, with a view to deepening the East Asia regional cooperation, the Chinese side has put forward, at the platform for the East Asia cooperation, a host of important cooperation initiatives covering such areas as connectivity, food security, poverty alleviation, tourism and combating corruption, which have won positive responses from all relevant parties. We expect that this year's series of Leaders' Meetings on East Asia Cooperation will focus on development and cooperation, further promote the pragmatic cooperation in such areas as economic growth, social and people-to-people exchanges and non-traditional security and send out the positive signal that the East Asian countries jointly pursue development and address challenges. We are convinced that Premier Li Keqiang's presence at this year's series of Leaders' Meetings on East Asia Cooperation is of great significance to building a higher level of China-ASEAN relations, fostering a closer China-ASEAN community of shared future and elevating the East Asia regional cooperation to a new stage. China and the Philippines are traditional friendly neighbors. Since the improvement of bilateral relations last year, the political mutual trust between the two countries has been deepened, the bilateral cooperation has been in full swing, the maritime dialogue and cooperation have been resumed and the China-Philippines relations have been moving forward for the better. Premier Li Keqiang's visit is the first visit of the Chinese Premier to the Philippines since the last visit ten years ago. During this visit, Premier Li Keqiang will hold talks with President Duterte and meet with other leaders from the Philippine side. Both sides will witness the signing of the cooperation documents in relevant areas. We believe that Premier Li Keqiang's visit is of great significance to cementing China-Philippines good-neighborly friendship and promoting the steady development of China-Philippines relations. At four o'clock this afternoon, we will hold a news briefing for media from both home and abroad at the Blue Hall. Assistant Foreign Minister Chen Xiaodong and Vice Minister of Commerce Wang Shouwen will offer you a detailed introduction on Premier Li Keqiang's visit and take your questions. We welcome your participation. Q: Today the Japanese Prime Minister, during his joint press conference with the US president, said that Japan could intercept the DPRK missiles if necessary. What is China's reaction to this comment? A: We all follow closely the situation on the Korean Peninsula and I would like to reiterate China's principled position in this regard. The current situation on the Korean Peninsula is already quite complex, sensitive and delicate. We hope that under the current circumstances, the words and deeds of all relevant parties can help to ease the tense situation, increase the mutual trust and pull the Korean Peninsula nuclear issue back to the right track of dialogue and negotiation. Q: According to media reports, on the evening of November 2, a group of Chinese tourists were robbed near a hotel in the province of Marne la Vallée, which is located to the southeast of Paris, causing the property losses for some tourists. What is the latest development of this incident? A: On the evening of November 2 local time, a group of Chinese tourists were robbed in the province of Marne la Vallée near Paris, France. After learning about this incident, the Chinese Embassy in France immediately got in touch with the French police and urged the French side to solve the case as soon as possible. According to our information, currently, the case is under investigation and the group of Chinese tourists who were robbed came back to China on November 3. The Chinese side attaches importance to the security and legitimate rights and interests of the overseas Chinese citizens. The Chinese Embassy in France has immediately issued the safety reminder saying that recently the situation of social security is grave in Paris and the Greater Paris Region has witnessed a series of violent robberies targeted at the Chinese tourists and the overseas Chinese people in France. The Chinese Embassy in France once again reminds the Chinese citizens travelling to France and the overseas Chinese people in France to follow closely the local security situation and the security reminders posted on the website of the embassy, step up vigilance and raise the security awareness. In case of emergencies, it is advisable to immediately call the police and contact the Chinese Embassy in France. We will continue closely following the development of the case, urge the French police to solve the case as soon as possible and bring the perpetrators to justice and take more effective measures to safeguard the security of the Chinese citizens in France. Q: US President Trump said in a TV interview broadcast this weekend that he would "certainly be open to" meeting with the DPRK leader Kim Jong-un. What is China's response to this statement and would China be willing to facilitate the talks? A: The Chinese side is always encouraging the DPRK and the US to carry out direct dialogue and engagement. We believe that any form of dialogue and engagement between the DPRK and the US, the parties directly concerned on the Korean Peninsula nuclear issue, is conducive to increasing the understanding of each other's positions as well as mutual trust and pulling the Korean Peninsula nuclear issue back to the right track of seeking settlement through dialogue, consultation and negotiation. We always hope that all relevant parties can make concrete, positive and tangible efforts to bring the Korean Peninsula nuclear issue back to the track of political and peaceful settlement at an early date. In view of this, we welcome and hold a supporting attitude to all the efforts that can help to move towards this direction. Q: Firstly, regarding the situation on the Korean Peninsula, during the joint press conference with President Donald Trump, Japanese Prime Minister Shinzo Abe said that China needs to play a more important role on the Korean Peninsula nuclear issue. What is China's comment on this? Secondly, on President Donald Trump's visit to Japan, the Japanese government made all-out efforts to receive him. What is China's view on this? A: On your first question, we do not need anyone to tell us what we should do on the Korean Peninsula nuclear issue. For many years, the Chinese side has made relentless efforts to facilitate the peaceful settlement of the Korean Peninsula nuclear issue through political and diplomatic means and has always been steadfastly playing a constructive role in this direction. We stay committed to promoting the realization of the denuclearization of the Korean Peninsula, maintaining the peace and stability of the Peninsula and facilitating the peaceful settlement of the Korean Peninsula issue through political and diplomatic means at an early date. We will continue to do so in the future and this is also the role and responsibility should be played and assumed by China, which is a responsible major country, a permanent member of the UN Security Council and a close neighbor of the Korean Peninsula. We hope that the other relevant parties can act like China to truly play their responsible role and make constructive efforts. On your second question, as the host country, it is the responsibility of the Japanese government to make all-out efforts to receive President Trump and ensure the great success of his visit. Q: The Indian Defense Minister Nirmala Sitharaman yesterday visited the border area in the so-called "Arunachal Pradesh". What is your comment on this? 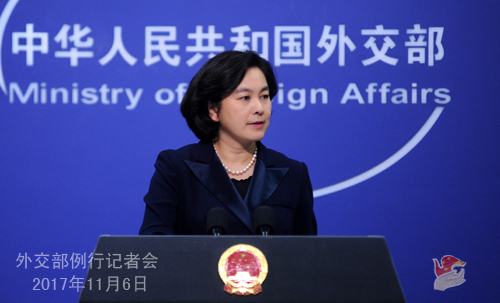 A: China's position on the issue of China-India border is clear-cut. It is an objective fact that there are disputes over the eastern section of the China-India border. We believe that Indian official's visit to the disputed area of the China-India border may complicate the border issue and is not conducive to the efforts made by the two sides to maintain the peace and tranquility of the border area. We hope that the Indian side can make concerted efforts with China to continue creating enabling conditions and atmosphere for the two sides to properly resolve the border issue through negotiation and uphold the overall picture of the bilateral relations.